Blomstrandhalvøya in Kongsfjorden one of the most famous sites in Spitsbergen outside today’s settlements. It is a regular landing site for tourists. 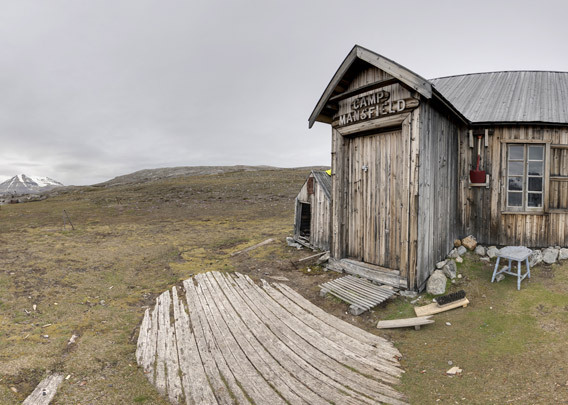 There is the stunning scenery of Kongsfjorden around it, there are the impressions of the local tundra and wildlife and there is a range of choices for excursions, from short and easy walks to long hikes up to the hills, the highest of which, Irgensfjellet, has an altitude of 385 metres. Blomstrandhalvøya is not, as the name suggests, a peninsula (-halvøya), but an island. 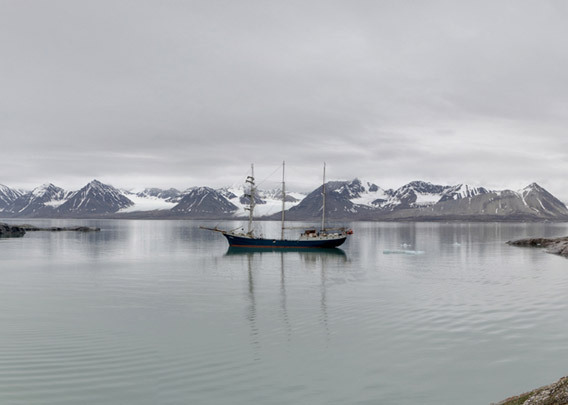 It used to be a peninsula until approximately 1990, when the glacier that connected it to the mainland of Spitsbergen retreated until the connection broke and Blomstrand became an island. The most famous single attraction on Blomstrandhalvøya is the old marble mine, which is today generally known as Ny London (New London) or just as London. This name is historically actually not quite correct, as it was never used in the days of the mining attempts. It was introduced later. The Englishman Ernest Mansfield, who “discovered” the marble occurrence on Blomstrandhalvøya and started prospecting and trial mining activities there for the Northern Exploration Company, called the place Marble Island. An appropriate name, considering the geology, which is mostly marble, and the one that was commonly used back then for a while. But today, the name London is officially recognised (it is on the official topographic map) and it is commonly used, so I use it also here. Mansfield first saw the marble on Blomstrand in 1906. The little bay of Peirsonhamna on the southern side of Blomstrandhalvøya provides a reasonably useful natural harbour at least for smaller ships, an important logistical requirement for any successful mining activity. Also freshwater was available, so the Northern Exploration Company (NEC) started activities on site in 1911 to prospect the occurrence and its economic potential. First huts were built, and eleven men are said to have spent the winter 1912-13 in London. Altogether, eight huts were built there, but only two of them remain. Both are regularly used by scientists from Ny-Ålesund, just 4.6 kilometres away on the other side of the fjord, for work or leisure. They are of the same type as the huts built by the NEC in other places (Camp Millar, Camp Morton). The sign above the door of one hut says “Camp Mansfield”. Also this is a name that was most likely never used in NEC times, it was introduced later. 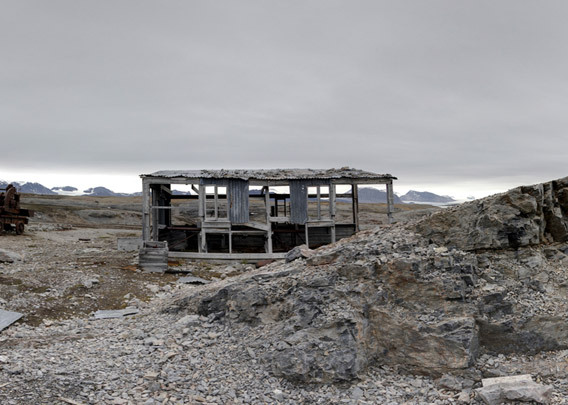 Some of the buildings from London/Marble Island were taken to Ny-Ålesund in the 1950s, where they are now known as “London-Houses” and used to house the Dutch scientific station. 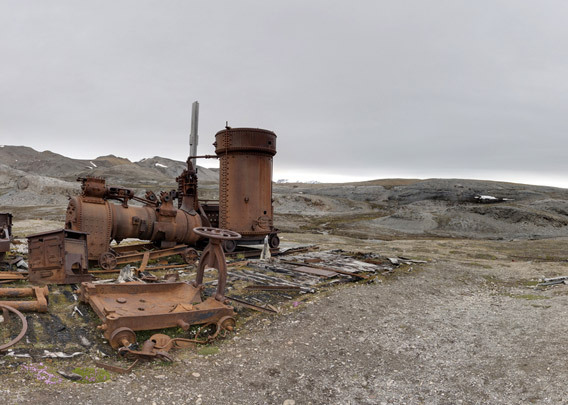 There are some eye-catching remains of machinery close to the mining camp Marble Island (London 🙂 ). These are steam-driven machines used for geological investigations: steam drills and rock cutting machines. The machines are standing on a wooden platform which was back then presumably the floor of a large workshop, the walls and roofs may have been taken down to be used elsewhere. Prospecting was done by numerous drillings and several small test pits. The most conspicuous of these is about 300 metres northwest of the former, little settlement of Camp Mansfield / London / Marble Island (whatever you prefer). Technically, this pit was probably made by means of blasting. It is the only one on Blomstrand where it is obvious that some marble was actually removed and taken away. 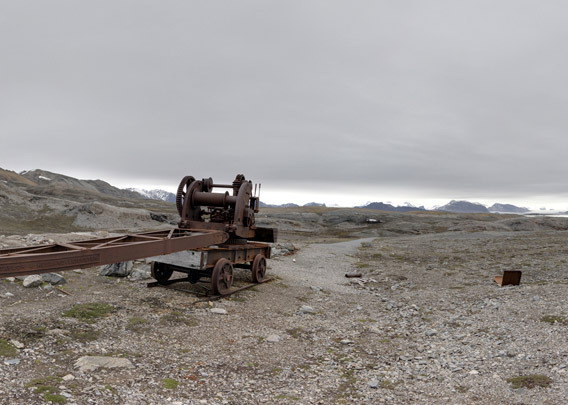 Next to this site, there is an old crane made to be used on a system of small railway tracks; another piece of industrial archaeology which is pretty unique in a regional (Spitsbergen) context. There are more sites on Blomstrandhalvøya where trial pits were made, but these are rather inconspicuous, some were just re-discovered in rather recent years. At least in some of them, cutting machines were used rather than explosives to extract marble in blocks of desired dimensions. The most beautiful marble does not yield any benefit if you can not transport it to the markets. 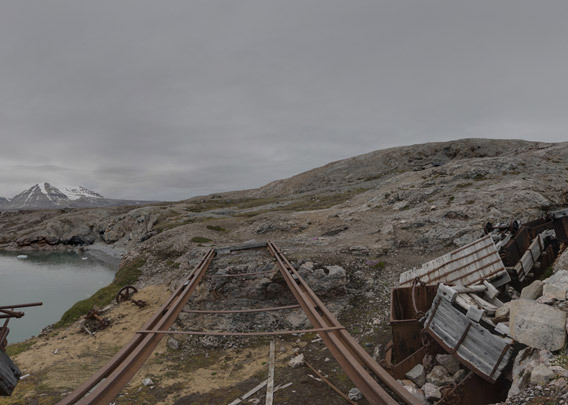 For this purpose, a little system of railway tracks was built – the northernmost railway track in Spitsbergen! There were actually just a few hundred metres of railway tracks, and even these tracks were not completed. For shipping, a crane was built on a little cliff on the west side of Peirsonhamna. Small ship could go alongside at the cliff to load marble. And the end of it? It is usually siad that it was the poor quality of the marble, which is at least partly visibly affected by cracking, that turned all efforts into a failure. There were, however, some enthusiastic expert opinions from marble experts who were provided with samples from Blomstrandhalvøya / Marble Island / London. It seems that the theory of the poor quality is at least incomplete. Further publications which are currently being prepared by historians and geologists may shed new light on this old story in the near future – we can be curious. Here it just remains to be said that the NEC sold their property on Marble Island in 1932 to the Norwegian mining company Store Norske. All attempts of the NEC to turn mineral resources in Spitsbergen into profit had then failed. At least in most cases, exaggerated expectations regarding the quality and quantity of the occurrence in question (coal, iron ore, asbestos, marble) was amongst the main reasons for these attempts that were economically fruitless, to put it mildly. For further reading, I strongly recommend Frozen Assets, the doctorate thesis of Frigga Kruse who made comprehensive studies of the early 20th century mining period in Spitsbergen. We may be curious what new knowledge Frigga and her colleague may mine in the quarries of Marble Island / Blomstrand / (Ny) London / Camp Mansfield (that’s all names I can think of now). Kruse, F. (2013). 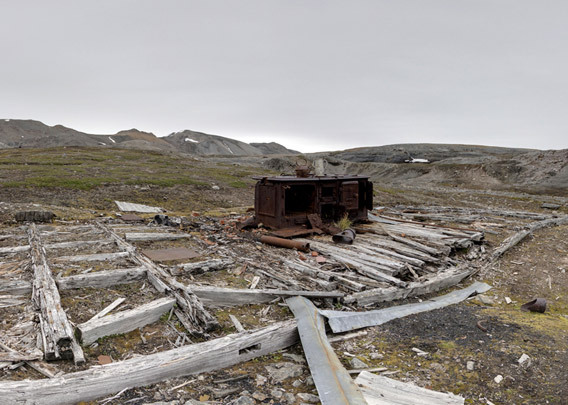 Frozen assets: British mining exploration, and geopolitics on Spitsbergen, 1904-53. Available online Researchgate.